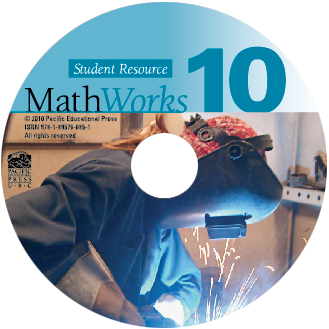 This CD contains the MathWorks 10 Student Resource in PDF and Flipbook formats with hyperlinks and searchable text. MathWorks 10 Student Resource was created to help students make a connection between what they learn in school and the real world of work. Each chapter is designed to engage students, build their knowledge, and help them develop reasoning, visualization, communication, problem-solving, and critical thinking skills.